The Hcigar Cartel (clone) mod is a 23mm Mechanical MOD that has highly conductive silver-plated contacts. It features a recessed laser-engraved switch / button with an extremely smooth throw, thick copper body, two-way adjustable center pin and it comes with three laser-engraved battery tubes. The Hcigar Cartel includes all three signature laser-engraved battery tubes to allow you to use 18350,18500 and 18650 batteries with one device. 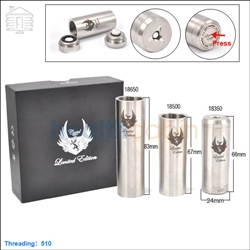 The two-way adjustable center pin allows you to adjust your Atomizer's connection or for any battery rattle. The Hcigar Cartel's recessed switch design allows you to stand this MOD safely on flat surface without the worry of it misfiring plus it has an extremely smooth throw (button push). Each switch has a signature laser-engraved logo and an individualized serial number. WARRANTY: 30 day limited manufacturer warranty. The warranty covers manufacturer defects only. It does not cover misuse or normal wear and tear on the product. awesome looking mod, quality made imho. priced great and shipping was fast. Would recommend to others.